1. Tell us about your recycling and food scrap collection program. What prompted you to institute such a program? We’ve been in business since 1970 and we started a composting program when we first started carrying produce. Initially it was just a collection and pick-up program with local farmers, but when our city implemented a commercial composting program we signed up immediately and and helped prompt a commercial pricing structure as the volume we were sending to be composting got larger every week. Our local composting program, called Food Plus! 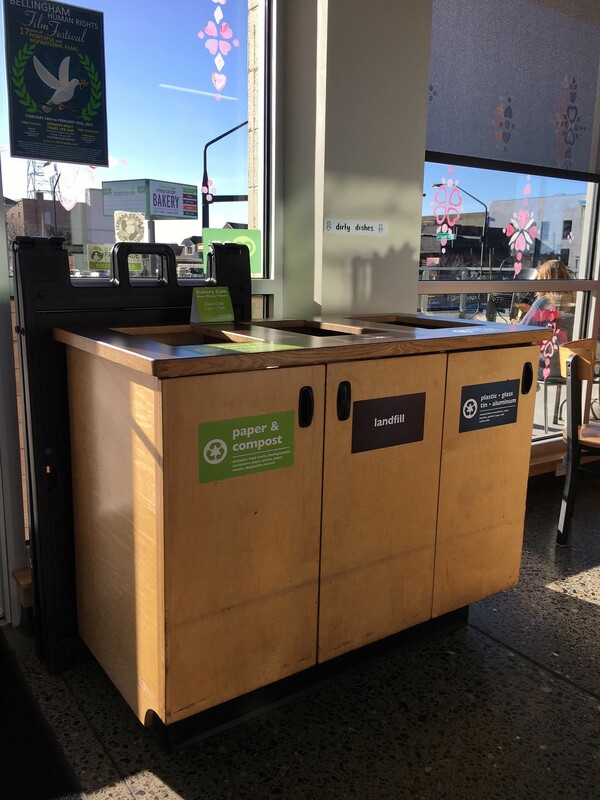 recycling, allows us to recycle not only food scraps including dairy/meat/bones but also other compostable materials like bioplastics and food soiled paper. 2. How many tons of food scraps of you diverted from the landfill? Are you seeing any trends? In 2016, we diverted over 153 tons of food scraps from the landfill. 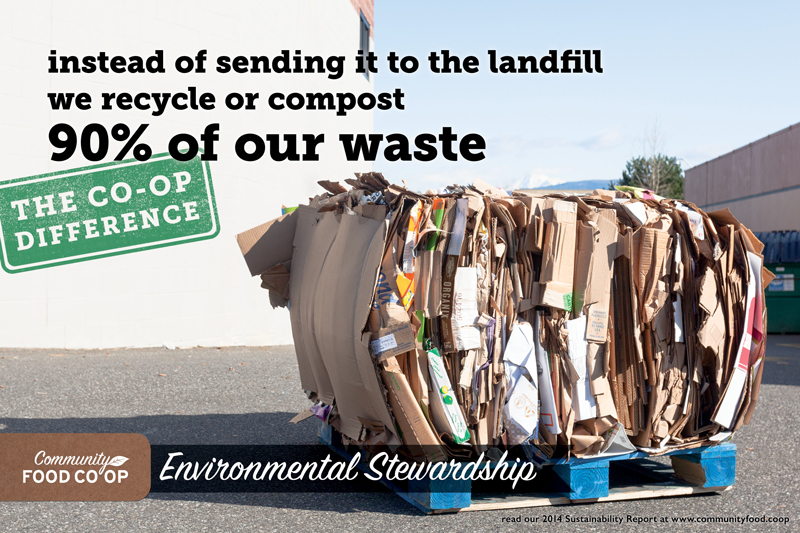 In addition, we recycled almost 18 tons of waxed cardboard (which is also composted in our region). 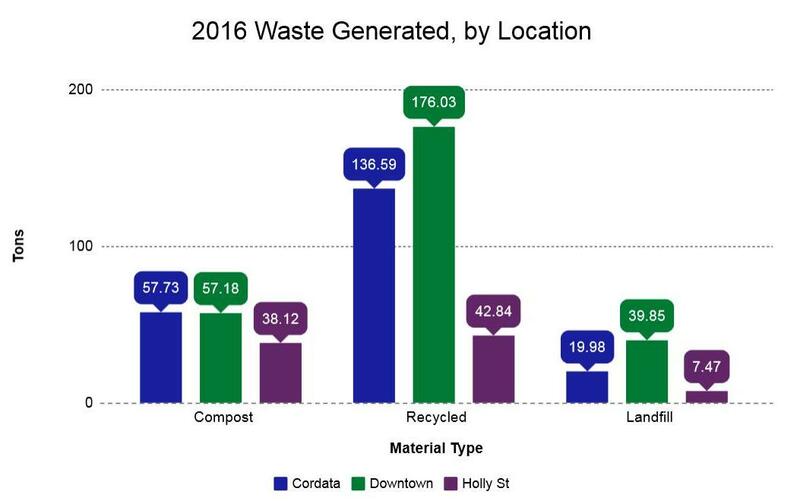 We diverted a total of 87% of our waste from the landfill in 2016. Determining how to measure your waste stream is something that we improve upon every year. We are not able to weigh all of our waste prior to it being picked up, so each year we further refine the measures we use to account for our waste. In 2016 we started using Portfolio Manager to track our waste stream and feel that we have the most accurate data to date. 3. When did you start the food scrap collection? We have been composting for over 40 years. 4. Who is the composter you work with? Who are the haulers? Sanitary Service Company www.ssc-inc.com pick up the majority of our waste. The compostable material is taken to a local processor called Green Earth Technologies. 5. What were the drivers for Community Food Co-op to have a recycling and food scrap collection program? When did these drivers begin to appear? Since we are a food cooperative, composting, recycling, and reusing were built into our DNA upon inception. Our founding members formed the organization so they could purchase products in bulk and save some money, but our overall community has been pretty focused on the environment and being conscientious of the amazing beauty that surrounds us since the 1970s. 6. What were the challenges? How did you address those challenges? Creating a large scale composting collection system internally was a pretty easy transition for us – the hardest part in the beginning was getting our local trash collectors to keep up with the volume we wanted to send to the compost facility. Once they were able to create a pricing structure that included dumpsters instead of just toters, we created more areas that compost could be collected and our rate continues to go up every year. Training our staff is ongoing and we recently started conducting waste audits to make sure that our contamination rate was low (it is well under 10%). 7. How have your employees received the program? How about your customers? It is a cultural norm at this point among staff; part of their training entails a recycling component in their new worker orientation as well as training directly related to their position, and every department in our organization recycles. Customers are also willing participants, although in our industry there is a certain expectation that composting is an option available in stores to customers. 8. Did you train your staff? If so, can you tell us a little bit about the training program? We have a section in our new worker orientation and put our reminders to staff when applicable. Our recycle bins are color coded so it is easy for staff to identify what item goes where, and we have updated our signage on bins to help staff further identify the correct bins. Staff are generally proactive in finding solutions and ask me frequently to research the recyclability of items that they come across during their shifts. 9. Have you engaged your customers to raise awareness about your program? One of our organizational goals this year is to further educate consumers about recycling and composting options in our community. We recently installed new signage on customer garbage areas that we hope simplifies for them what items are recyclable or compostable. We are referring to garbage as “landfill” now with the hope that word will trigger customers to look for an alternative for the item they are wishing to throw away. We are planning on creating shelf talkers to help customers determine how to recycle various packaging for items we sell, and we are setting up some new collection programs in our stores, including recycling of cosmetics packaging. 10. How did compostable packaging help your efforts? Because we are composting almost 1000 pounds of food waste per day, it is incredibly important that we are using compostable bags that can handle the amount of weight we need them to hold. We have tried other commercial compostable bags, but have found that the strength and durability of Natur-Tec bags are top notch. The last thing we need during a busy lunch rush is a bag “exploding” in the kitchen when we go to empty our receptacles – the right tool for the job are important for efficiency and not to mention staff morale! 11. What are your thoughts on these food scraps turning into compost? The commercial composting facility where our compost is sent sells us the finished compost that we then sell to our customers, completing the loop. So at its most basic, we are growing food locally, consuming it, composting it, and then using it to grow more local food. So we think that’s pretty cool. 12. How has the community embraced these efforts? We are lucky that our composting program is so inclusive; it makes it very popular with the community as it is an affordable way to dispose of yard, kitchen, and household debris (they can also accept tissue paper, fabric, corks, etc. in our local compost pickups). That being said, there could always be a higher level of participation with more education. We will try to address that from a retailers standpoint in 2017. 13. How do you see yourself building on this program and do you feel the community will respond in turn and develop additional programs of their own? We are always looking for ways to increase our efficiency and contamination rate with our recycling endeavors, and we hope that our community looks to us a leaders in this area. We are more than happy to offer our support and we work with students from our local university during the year to help us audit our practices. All information on our waste is available to the public. 14. What have you learned from the process of implementing this program? Would you have done anything differently? Recycling and composting have always been part of our business structure, but every year we add a little something that makes it more efficient, like the color coding system we instituted in 2016 to help staff easily identify the various recycling bins we have located in our staff areas. We would like to extend a big thank you to Melissa and her excellent team for their availability and enthusiasm for recycling and food scrap collection. 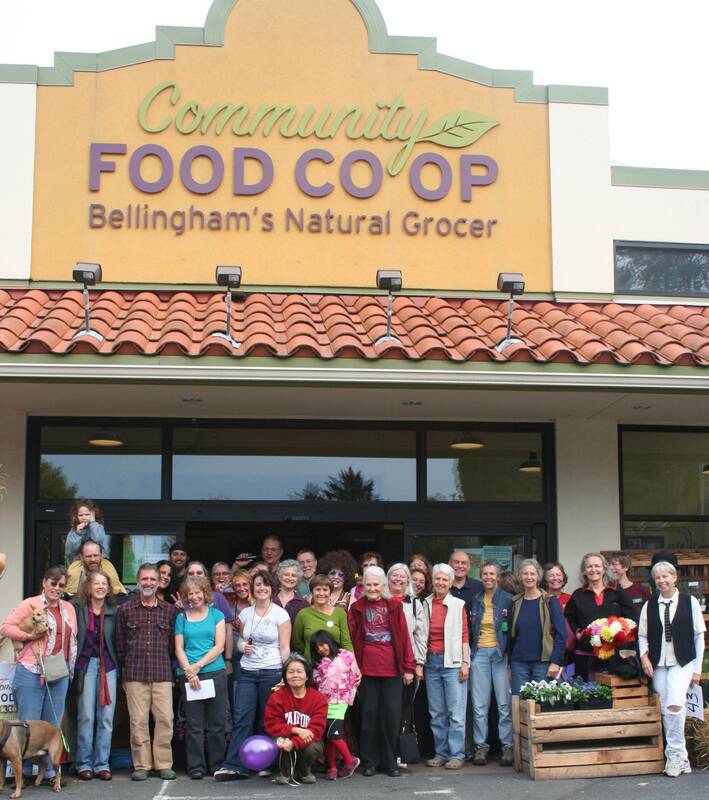 Passionate programs such as Community Food Co-op's are a model to strive for and we're so excited to see communities such as Bellingham's show such high levels of commitment to organics recycling, diversion, and sustainability! 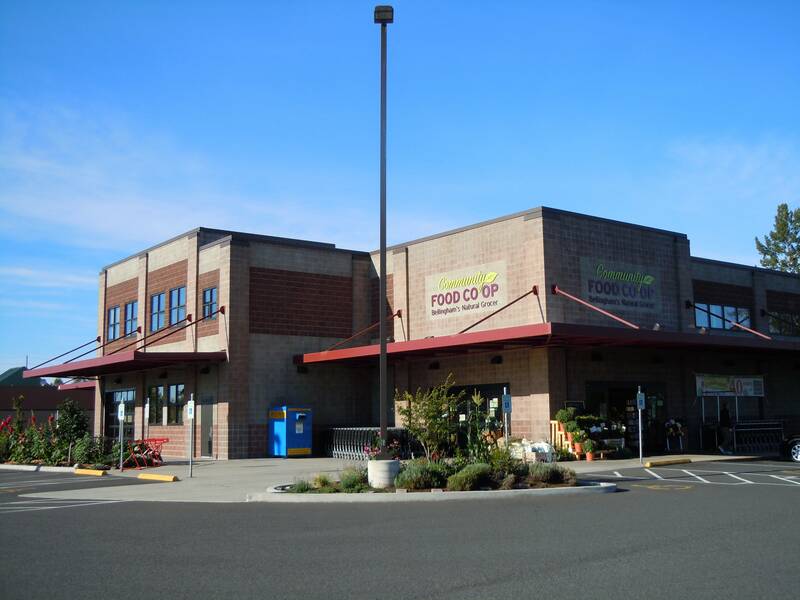 To learn more about Community Food Co-op, please visit their website at http://communityfood.coop/ or on Facebook and Twitter.